Some people collect coins. For others it can be shoes, stamps, artwork, or books. My weakness happens to be anything guinea pig related. So when I caught wind of these adorable piggy shaped cookie cutters I squealed and immediately set about getting my hands on one. 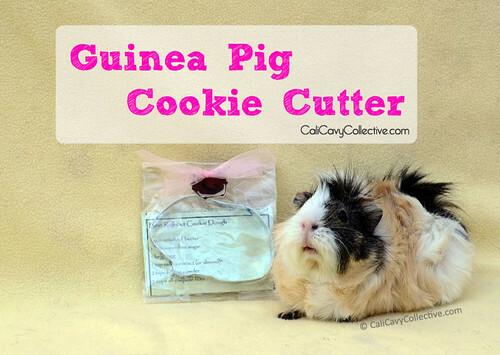 The cookie cutter would make a great gift for any guinea pig lover or baking enthusiast. 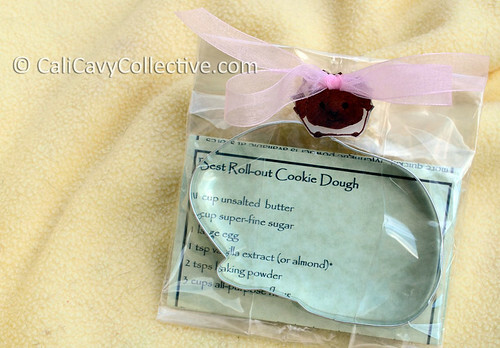 Measuring 3" by 4.5", it comes prepackaged with a pretty bow and a recipe for cookie dough and icing. 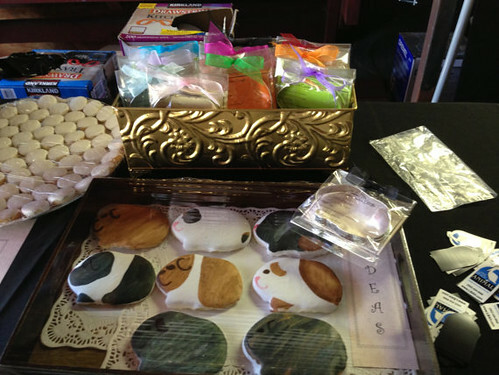 Find it at Wheek Boutique, an Etsy shop run by Orange County Cavy Haven volunteers. They also sell cozies, cuddle cups, cage liners, and lap pads. Proceeds go to support OCCH rescue efforts. I loved the cookie decorating ideas above provided by OCCH volunteer Tammy Geisick. So many decorating possibilities - you can use icing, chocolate, nuts, or raisins to make lookalikes of your pig, or make another pig altogether. I already have plans to dress up an entire herd of cookies... now whether they'll turn out looking like piggies or potatoes is another story. Anyone else planning on buying one? Do you have any decorating ideas to add? If you freeze your cut-out cookies before you bake them, they'll retain their shape better (not potatoes). If you have time, put them in the freezer for about an hour before you bake them. You may need to add a few extra minutes baking time. After baking, let them cool 10 minutes, then put them in the freezer for several hours until good and frozen. When you're ready, make your icing, dip each cookie, and set it on a cooling rack to dry. It helps to add meringue powder. This will help the cookies dry faster and have a harder (still delicious) shell. Then grab a brush, some food coloring (I use a plate as my palette), paint, and allow to dry.